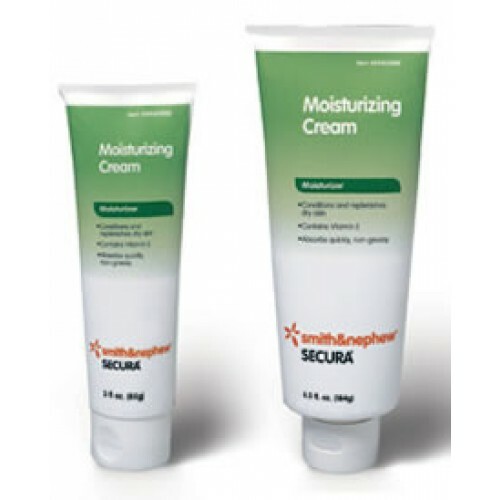 Secura Moisturizing Cream, by Smith & Nephew, is a clinically-tested, prescription-strength moisturizing cream designed to moisturize and protect dry skin. Utilizing a unique blend of fortified ingredients, including petroleum and Vitamin E, Secure Moisturizing Cream conditions and soothes when applied daily or after a shower or bath. Goes on smooth, without leaving a greasy residue. Secura Moisturizing Cream is a strong enough to treat even the driest skin, as well as healing rough, cracked areas around scrapes and burns, helping to prevent scarring. The Cream is light, goes on smooth, and is not scented, resulting in a smooth, rejuvenating feeling. Vitality Medical also carries other skin products such as the Comfort Bath Heavyweight Cleansing Cloths and Aloe Vesta Cleansing Foam. Restores Moisture to Very Dry Skin. Recommended For Daily Use or After Bathing. Contains Petroleum and Vitamin E.
Conditions and Soothes Dry Skin.